Seven Stories Press, 9781609807979, 448pp. William A. Noguera has spent thirty-four years at the notorious San Quentin Prison, home to the nation’s largest and deadliest death row. Each day, men plot against you and your life rests on a razor’s edge. In Escape Artist, he describes his personal growth as a man and artist and shares his insights into daily life and the fight to survive in the underworld of prison culture. After being sentenced to death, he arrived at San Quentin Prison and was thrown into a rat-infested cell—it was there that he discovered the key to his escape: art. Over the next three decades, Noguera rebelled against conventional prison behavior, and instead forged the code he lives by today—accepting responsibility for his actions, and a self-imposed discipline of rehabilitation. In the process, he has explored his capacity to bring focus and clarity to his artistic vision. Escape Artist exposes the violence, politics and everyday existence within the underbelly of society that is prison life. 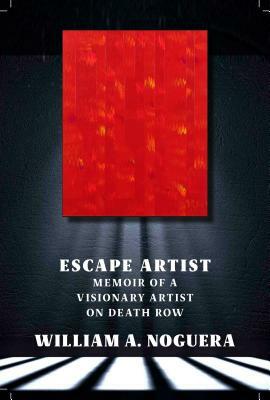 In an unprecedented narrative, Noguera reveals the emotional and heart-wrenching loss that landed him on death row and the journey he has taken to become an award-winning artist, speaker, and author—a tale of one man’s transformation through tragedy. As an award-winning artist, author and speaker, William A. Noguera has gained international attention and received accolades for his photographic hyper-realistic ink compositions, profound mixed-media paintings, hybridized abstract expressionism and neo-constructivist wall sculptures—exhibiting in Paris, New York and San Francisco. Noguera has been the subject of over 35 articles in such publications as Forbes, The New York Times, The San Francisco Chronicle, and BOOM! A Journal of California. Besides being an artist and lecturer, Noguera is a former Hapkido Middle-Weight Champion. Since writing his memoir, Noguera has aspired to help others through lectures at MBA programs and as a radio guest speaker, concentrating on prevention and intervention. Noguera’s inspiration is simple: pay his debt to society by creating art for charitable causes and encouraging others, and writing and speaking about what it takes to make progressive self-change and the continuous effort that is required for someone to have a positive influence on others. Noguera’s talks share an eye-opening, thought-provoking narrative on the realities of wrongdoing, prison life, ethical responsibility, prison gangs, their culture, the ramifications of destructive behavior, and the rewards of constructive rehabilitation.